Here is the last card from Club last weekend, made in response to a request to do something with acetate. SU! has the window sheets in the Mini Catalog now and that was the spark for the request! 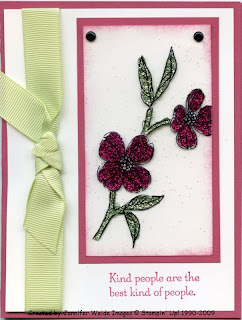 The card base is Rose Red with a Whisper White layer. Wide Certainly Celery grosgrain ribbon knotted around. It's hard to see in the picture, but this uses the Sparkly Stained Glass technique (tutorial here on SCS). The top sheet is acetate that we stamped the flower image on in Jet Black StazOn. We let that dry briefly, then turned it over and applied Crystal Effects in three stages. First, the center of the flower to which we added light blue glitter (it looks green for some reason, but it was blue!!). Second, the flowers to which we added rose glitter. Lastly, the leaves and stem to which we added green glitter. All the glitters were from the Fine Cosmo set of glitter. We let the image dry (while we did all the cutting of butterflies from the last post!). To finish, we attached the acetate to a piece of Whisper White the same size with Vintage brads at the top, layered on a slightly larger piece of Rose Red and attached to the card. The verse was stamped below the image in Rose Red.